How many of you were aware this? A twitter message can feed a dog. When we are outside at work or anywhere, we can feed the dog at home from where we are. Its really a good system for pet lovers. This system was developed an year ago, but many of us are not aware of this. 1. A "feed" tweet is sent to "@feedtoby"
2. It is received by Nanode Microcontroller(mini-computer). It is an Arduino clone with ENC28J60 ethernet. 3. A motor from HP Deskjet 500 had been used here. The motor is linked with Nanode Microcontroller. 4. As soon as the message been received by the mini-computer, a buzzer sounds and, Toby is been intimated. 5. Now, the motor opens the trap door and make the food or snacks fell down to Toby. Here an camera is set to take images after serving the food, in-order to know whether Toby had tasted its food. Watch out the video of system mechanism and the Toby. 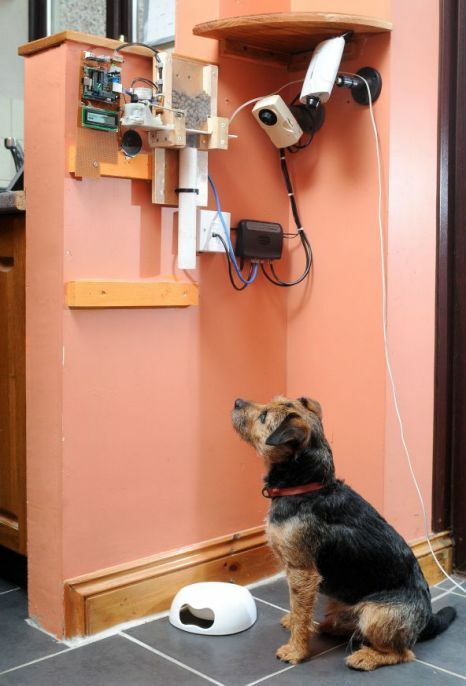 Readers, if this system strikes every home,its easy to feed your pet from anywhere in the world.